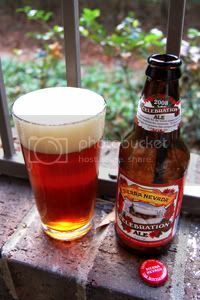 Celebration Ale is Sierra Nevada's Winter seasonal and has garnered quite a reputation in the beer geek community as one of the best. Like the company's Fall seasonal, Anniversary Ale, Celebration is an India Pale Ale and slightly different each year. Two back-to-back India Pale Ale seasonals might seem a bit strange, but it makes sense for a company that built it's reputation on hops. And as much as I love a good IPA, I couldn't be happier with their decision. Celebration has racked up numerous medals in various beer contests, including a gold at the United States Beer Tasting Championship and a silver at the Great American Beer Festival. Stan Sessor of the San Francisco Chronicle went so far to call Celebration Ale the "best beer ever made in America." The beer is bittered with Chinook hops and dry-hopped with Cascade and Centennial varieties. Recently, the 2008 edition has started to show up here in Houston, and I'm eager to try my first ever Celebration. Let's see what all the fuss is about, shall we? Appearance: Pours a slightly hazy golden-amber below a glorious, two-finger off-white head with great lacing. Brilliant looking beer. Aroma: Grapefruit, orange peel, and piney hops over a sweet, brown sugar malt. Everything is in it's perfect proportion here. Taste: Piney and citrusy hops are in the forefront, with grapefruit and orange the dominant varieties of citrus. The malt backbone is mostly pale with some caramel coming through. Every now and then, a bit of alcohol shines through it all. This beer is sublimely balanced. Mouthfeel: Medium-bodied with moderate carbonation. The finish is a little dry and does well to keep the bitterness going. Verdict: Simply one of the best American IPAs I've sampled yet, Celebration is certainly something I'll look for each Winter. Miles ahead of Sierra Nevada's other seasonal IPA, Anniversary Ale, this is the Sierra Nevada IPA to get. I'm not sure if this is the best beer America has ever produced, but it's probably on the short-list. Brilliant. Spot on, I couldn't agree more. I love this beer, especially when it's cold out. Thank you for your comments. Celebration really is a terrific beer, I think I'll be buying this every Winter from now on.